The PXIe-8135RT is a modular PC in a PXI Express 3U-size form factor. The following figure is a functional block diagram of the PXIe-8135RT. Following the diagram is a description of each logic block shown. The SO-DIMM block consists of two 64-bit DDR3 SDRAM sockets that can hold up to 8 GB each, for a total of 16 GB. The PXIe-8135RT removable hard drive variant has a single SDRAM socket, for a total of up to 8 GB. The SMB to PXI Express Trigger provides a routable connection of the PXI Express triggers to/from the SMB on the front panel. The ATI Radeon E4690 Embedded GPU drives the graphics. The Watchdog Timer block consists of a watchdog timer that can reset the controller or generate a trigger. 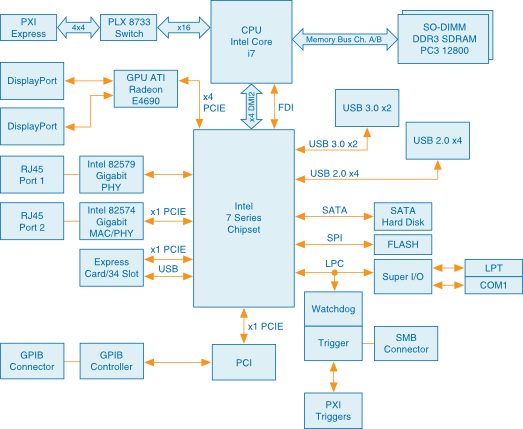 The Intel 7 Series chipset connects to the PCI, USB, Serial ATA, ExpressCard, PXI Express, and LPC buses. The USB Connectors connect the Intel 7 Series chipset to the Hi-Speed USB 2.0 interface and USB 3.0 interfaces. The Serial ATA Hard Disk is a 250 GB or larger notebook hard disk. The Serial ATA interface enables transfer rates up to 600 MB/s. The hard disk also supports Native Command Queuing. The PXIe-8135RT removable hard drive Serial ATA interface enables transfer rates up to 300 MB/s. The PXI Express Connector connects the PXIe-8135RT to the PXI Express/CompactPCI Express backplane. The Super I/O block represents the other peripherals supplied by the PXIe-8135RT. The PXIe-8135RT has one serial port, and an ECP/EPP parallel port. Both the 82579 and 82574 Gigabit Enet ports connect to either 10 Mbit, 100 Mbit, or 1,000 Mbit Ethernet interfaces. Both ports are housed in a dual stacked Ethernet connector. The GPIB block contains the GPIB interface. The ExpressCard/34 slot accommodates an ExpressCard/34 module. 1 The extended-temperature, 24/7 option controller provides 80 GB hard drive.